Cast: James Stewart ( George Bailey ); Donna Reed ( Mary Hatch ); Lionel Barrymore ( Mr. Potter ); Thomas Mitchell ( Uncle Billy ); Henry Travers ( Clarence ); Beulah Bondi ( Mrs. Bailey ); Gloria Grahame ( Violet Bick ); H. B. Warner ( Mr. Gower ); Ward Bond ( Bert ); Frank Faylan ( Ernie ); Samuel S. Hinds ( Pa Bailey ); Mary Treen ( Cousin Tilly ); Frank Hagney ( Bodyguard ); Sheldon Leonard ( Nick ); Alfalfa Switzer ( Freddie ). Goodrich, Frances, and others, in The "It's a Wonderful Life" Book , edited by Jeanine Basinger, New York, 1986. Jones, Ken, D., The Films of James Stewart , New York, 1970. Thompson, Howard, James Stewart , New York, 1974. Scherle, Victor, and William Levy, The Films of Frank Capra , Secaucus, New Jersey, 1975. Malard, Charles J., American Visions: The Films of Chaplin, Ford, Capra, and Welles , New York, 1977. Bohnenhamp, Dennis, and Sam Grogg, Frank Capra Study Guide , Washington, D.C., 1979. Eyles, Allen, James Stewart , London, 1984. Hunter, Allan, James Stewart , New York, 1985. Robbins, Jhan, Everybody's Man: A Biography of Jimmy Stewart , New York, 1985. Ray, Robert B., A Certain Tendency of the Hollywood Cinema 1930–80 , Princeton, 1985. Carney, Raymond, American Vision: The Films of Frank Capra , Cambridge, 1986. Lourdeaux, Lee, Italian & Irish Filmmakers in America: Ford, Capra, Coppola & Scorsese , Springfield, 1993. Gehring, Wes D., Populism and the Capra Legacy , Westport, Connecticut, 1995. Hawkins, Jimmy, It's a Wonderful Life: The Anniversary Scrapbook , Philadelphia, 1996. Hawkins, Jimmy, It's a Wonderful Life Trivia , New York, 1997. Thomas, Tony, A Wonderful Life: The Films and Career of James Stewart , Secaucus, 1997. Quirk, Lawrence J., James Stewart: Behind the Scenes of a Wonderful Life , New York, 1999. New York Times , 23 December 1946. Sklar, Robert, "The Making of Cultural Myths: Walt Disney and Frank Capra," in Movie-Made American , New York, 1975. Ahrlich, Evelyn, "Frances Goodrich and Albert Hackett," in American Screenwriters , edited by Robert E. Morsberger, Stephen O. Lesser, and Randall Clark, Detroit, 1984. Raynes, Doug, " It's a Wonderful Life ," in Soundtrack! , vol. 8, no. 29, March 1989. Magny, Joël, "La vie est belle : Frank Capra," in Cahiers du Cinéma (Paris), Hors-série, 1993. Fallows, Randall, "George Bailey is the Vital Center: Postwar Liberal Politics and It's a Wonderful Life ," in Journal of Popular Film & Television (Washington, D.C.), vol. 25, no. 2, Summer 1997. Alter, J., "It's a Wonderful Legacy," in Newsweek , vol. 130, 14 July 1997. Deneen, P.J., "George Bailey's Secret Life," in Commonweal , vol. 124, 19 December 1997. 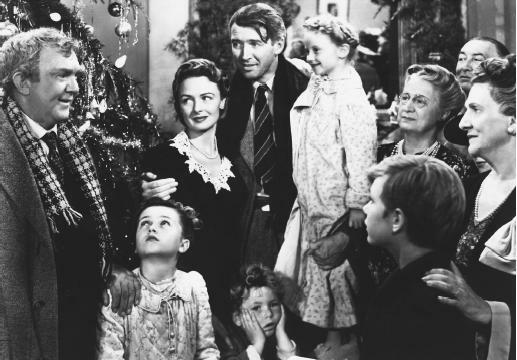 The impetus and structure of It's a Wonderful Life recall the familiar model of Capra's pre-war successes. Mr. Deeds Goes to Town, Mr. Smith Goes to Washington and Meet John Doe . In each of these films, the hero represents a civic ideal and is opposed by the forces of corruption. His identity, at some point misperceived, is finally acclaimed by the community at large. The pattern receives perhaps its darkest treatment in It's a Wonderful Life . The film's conventions and dramatic conceits are misleading. An idyllic representation of small-town America, a guardian angel named Clarence and a Christmas Eve apotheosis seem to justify the film's perennial screenings during the holiday season. These are the signs of the ingenuous optimism for which Capra is so often reproached. Yet they function in the same way "happy endings" do in Moliere, where the artifice of perfect resolution is in ironic disproportion to the realities of human nature at the core of the plays. George Bailey is presumably living the "wonderful life" of the title. Having abandoned his ambition to become an architect in order to run a building- and loan-association, and facing arrest for a discrepancy in the books, George is on the verge of suicide. His guardian angel offers him the chance to find out what would have happened had he not been born. George then sees the town as a nightmarish vision of corruption. No one knows him. Even his mother, a benevolent image through the rest of the film, appears hard-bitten and cruel, and refuses to recognize him in a scene that dramatizes a primal identity crisis. George does regain his identity and is euphorically acknowledged by everyone. But this joyous finale caps a film that so often represents pain and despair—from a slap that draws blood from young George's ear, to a marriage proposal expressed in utter frustration, to the images (both inside and outside the fantasy section of the film) of George in a rage, furious with himself and with those he loves. Here, as in Mr. Smith Goes to Washington , James Stewart embodies the hysterical energy of Capra's quintessential American hero, thereby conveying, along with the director, the ambiguities of the American dream along with its promises.